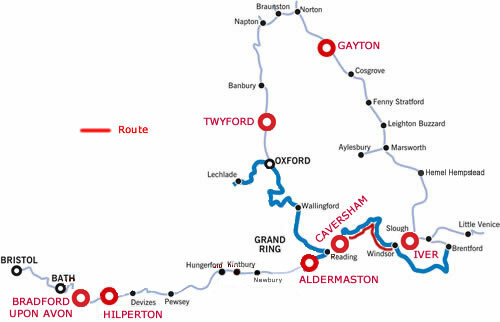 Cruise to the Royal town of Windsor and visit its famous castle and Legoland .Windsor castle is the largest inhabited castle in the World, established by William the Conqueror during the 1070's the present castle was started by Henry 11 during 1165-1179. It has been meticulously restored after the disastrous fire in 1992. Discover the magnificence of Henry VIII's favourite royal residence at Hampton Court Palace. Immerse yourself in the sights and sounds of the bustling Base Court and marvel at the breath-taking grandeur of Henry's State Rooms. Stroll through over 60 acres of enchanting gardens, lose yourself in the famous maze and appreciate the beauty of one of the greatest palaces on earth. Along the way you pass Legoland and Thorpe Park so you can keep the kids busy, whatever their age! It is 3 hours from Henley to here. At Bourne End the river is very wide and favoured for sailing , but beware below Cookham Bridge where the river splits into 4, make sure you take the clearly marked lock cut. Emerging from the cut you reach the lock with a steep thickly wooded hillside which marks the grounds of Cliveden owned by the National trust. Nowadays you can only appreciate this former home of the Astor family from the beautiful gardens, see website for opening times. The outskirts of Windsor are reached, the racecourse on your right is the only figure of 8 course in the country. There are horse racing fixtures throughout the year. There are moorings before or after Windsor railway Bridge, Windsor is to the south of the River, Eton to the North. It is 8 hours cruising from Henley to here. There are fine views across the park to Windsor between the Victoria and Albert bridges, below the last bridge the navigation passes Ham Island now a bird sanctuary, to Old Windsor Lock towards Runnymede . The Magna Carta Memorial can be seen through the trees. 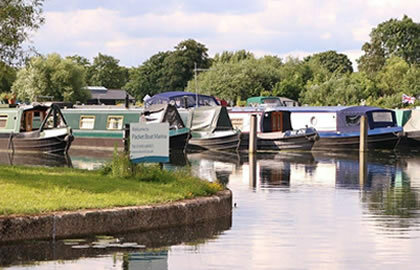 At Penton Hook marina which is approached below the lock, it is possible to get overnight mooring and a short distance away is the mega theme park- Thorpe Park - Thorpe Park is not for the faint‑hearted. It has some of the biggest roller coasters in Europe and the rides here are built to scare. It is perfect for adrenalin junkies. The river twists and turns past Chertsey and Weybridge, although the Desborough Cut removes some of the twists and turns. The River Wey joins the Thames here. Walton on Thames is on your right, Shepperton and its famous film studios are to the north near the vast reservoir. Sunbury Court Island is lined with immaculate chalets and bungalows. Below Hampton Bridge is Hampton Court Palace, close to the river but protected from it by a long red brick wall. It is just over 19 hours back to the marina, so 3 days cruising, but if you are on a 10/11 or 14 nights trip you will have taken your time to get here and get back again as there is much to see and do and admire.